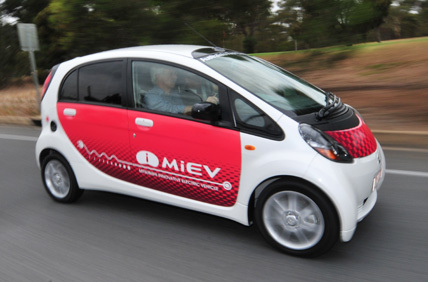 Mitsubishi Motors Corp., maker of the i-MiEV electric car, plans to introduce eight hybrid and battery-powered models by 2015 as demand for fuel-efficient automobiles grows. The automaker also aims to increase annual global sales to 1.37 million vehicles by fiscal 2013 from 1 million in the current year ending March 31, the Tokyo-based company said today in a statement outlining its mid-term business plan. Mitsubishi will increase the proportion of its overseas production to 54 percent of total output by fiscal 2013, from about 44 percent currently, it said. Japanese carmakers including Mitsubishi and Toyota Motor Corp. are moving output overseas as a strengthening yen makes it more difficult to export vehicles at a profit. The carmaker aims to boost net income to 45 billion yen ($548 million) in the year ending March 2014. Operating profit is projected at 90 billion yen on sales of 2.5 trillion yen. Mitsubishi said it may invest in a local partner in Brazil as it shifts production abroad. The carmaker will increase output in emerging markets as well as the U.S., President Osamu Masuko said today in Tokyo. As part of the plan to offer more hybrids and electric vehicles, the automaker aims to sell two plug-in hybrid autos by fiscal 2012, it said.